Did WikiLeaks pay for the documents? Pfc. Bradley Manning allegedly suggested to someone at the Kansas military prison where he is being held that WikiLeaks paid for the hundreds of thousands of leaked documents, according to a legal document filed in the Article 32 proceedings for Manning. This suggestion of payment for secrets could be a pivotal issue in the Manning case, and down the road in any potential effort by the government to prosecute WikiLeaks founder Julian Assange. The heavily censored legal document filed by the defense lawyer for espionage suspect Bradley Manning suggests the admission came up in conversation between Manning and an unidentified person at the military prison at Fort Leavenworth, Kansas. The existence of the document was first reported by Politico. "He will testify that he explained the purpose of his visit and asked PFC Manning who he was and why he was at the JRCF (Joint Regional Correction Facility)," the document says. The name and details were blacked out out in the document by the Army Criminal Court of Appeals before it was provided to CNN as the result of a Freedom of Information Request. "PFC Manning allegedly responded with, 'I sold information to WikiLeaks,' " according to the defense document. "Shortly after this alleged statement, the guards realized that (name blacked out) should not have been in the pre-trial area," the statement continues. But the claim seems to contradict a claim made by Manning to a hacker named Adrian Lamo. Manning confided in Lamo about his access to the classified documents. In an instant message exchange obtained by Wired Magazine, Manning wrote he could have made a lot of money selling the documents to Russia or China but rejected the idea because "it belongs in the public domain," and "information should be free." The document lists 48 possible witnesses, most of which were denied by the investigating officer overseeing this preliminary Article 32 hearing. The list seems to include President Obama, Secretary of State Hillary Clinton and other high-ranking officials, but the names and much of the details are redacted. 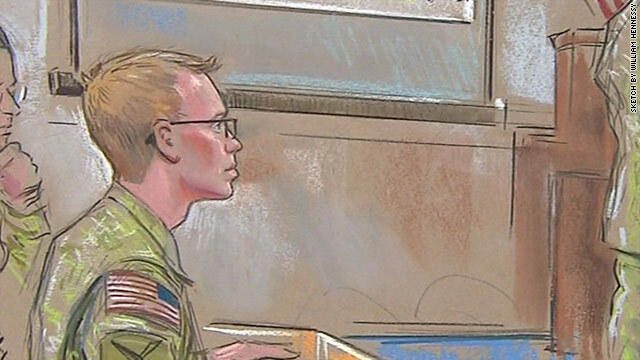 The defense criticized the investigating officer for refusing most of their witness requests and it appears the person who heard the alleged statement by Manning at Leavenworth did not appear at the hearing this week. If making money from war is a crime, then Bush, Cheney, and the CEOs of all the defense contractors should be in prison.